Republicans tried to stop you from making more money. 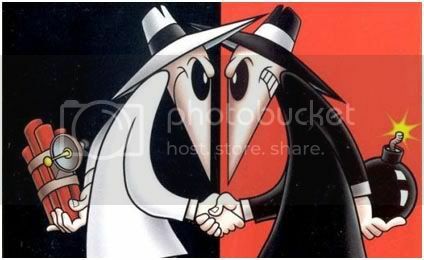 Spy VS Spy OR Communication Breakdown? You have to wonder just what, exactly, they are digging into that they feel the need to leak it to the press? intentionally in order to "make someone look bad?" Wolffe says that the White House is in very early stages of this investigation. Olbermann reported that the president will make a statement [today] around 4pm. Later on the Rachel Maddow Show, Wolffe walked the story back a bit, leaving me thinking that looking into this on the part of the White House is probably more a routine effort to touch all bases. But the fact that they would leak this kind of line of questioning seems a bit more revealing than just some routine review of this Security failure. Below the fold is the video from Countdown. Read more about Spy VS Spy OR Communication Breakdown? a bailout in a situation that dwarfs even what happened at AIG. insurers, whether or not you want it to. their Medicare and Medicaid reimbursement rates. This clip from Countdown with Keith Olbermannis must listening. He exposes how the Republicans have kicked off their campaign against Universal Health Care by attacking the Stimulus Bill, and follows the story from the Drudge Report and Rush Limbaugh to CNN and Lou Dobbs. Paul Krugman picked up on the fact that funding for "medical research" which had been removed from the Stimulus Bill by the Senate Compromise has been put back into the final package. He links to one of his earlier blog entries where he discusses the issue involved. The point is to put data to substantiate abuses by drug companies and insurers. Here's Krugman's explanation of the issue and what's freaking the conservatives. He links to an earlier Wall Street Journal article that explains why the drug and medical-devide industries have been mobilizing to gut a proviso in the stimulus bill on research comparing medical treatments. They right wing is raising the hoary spectre that this would be opening the door to government rationing. Here's the link that Krugman provides to their excellent summary of the issues. International Criminal Tribunal - U.S. Torture? What Johnathan Turley says, with heavy heart and disbelief we've gone this far as a Country, should be brought into public discussion and possible implementation, as our Representatives seem to be hell bent on going along with the administrations shredding of the Constitution and the Laws of this Country! Read more about International Criminal Tribunal - U.S. Torture?